The Handyguys analyze the noisy question that is a major issue in modern homes.Â How do you isolate yourself from disruptive sounds originating in another part of the house?Â Whether the problem is noisy children or televisions; sometimes we just need to get away from it all.Â The Handyguys are no exception… they need to record a podcast each week in a quiet room! I work from my home office and my children can often be heard while in the office or on the phone. The room is about 12 x 14 (12 foot ceiling) and on the main floor. Two walls are exterior and two interior. Aprox 3 feet of the walls have oak wood paneling on top of the drywall. The other 11 feet have drywall and a thick cloth-like wallpaper. It looks like the studs are 2×6 and the doors are paneled glass french doors (solid wood). There are no rooms above the office and the basement below is unfinished so all the sound is coming through the two interior walls. We are ready to take down the wall paper and paint but want to do anything we can to make the office as sound proof as we can – preferably DIY. I’ve heard some people recommend cutting holes in the drywall and blowing in insulation and others say insulation won’t help. Some recommend double drywall but I think that would make the two door frames and window not look “right”. I’ve heard there are sound absorbing paints and sound absorbing drywall and on and on. I’ve heard that single pane glass and the gaps under the door could be the biggest culprit. What is the first most effective thing I could do followed by the second and third and so on. I’d like to get to the point where the kids could be playing or even yelling and not be heard inside. Click on this thumbnail for a full sized version. This image illustrates various techniques and their efficacy (do handyguys use words such as efficacy?) for controlling sound passage between adjacent spaces. The passage of sound is measured by the scientific geeks using a number called the STC. STC stands for Sound Transmission Class. It refers to sound waves moving through air and objects. The higher the number the less sound can pass. The techniques shown use a combination of mass (sound doesn't travel as well through objects as it does air) and decoupling. 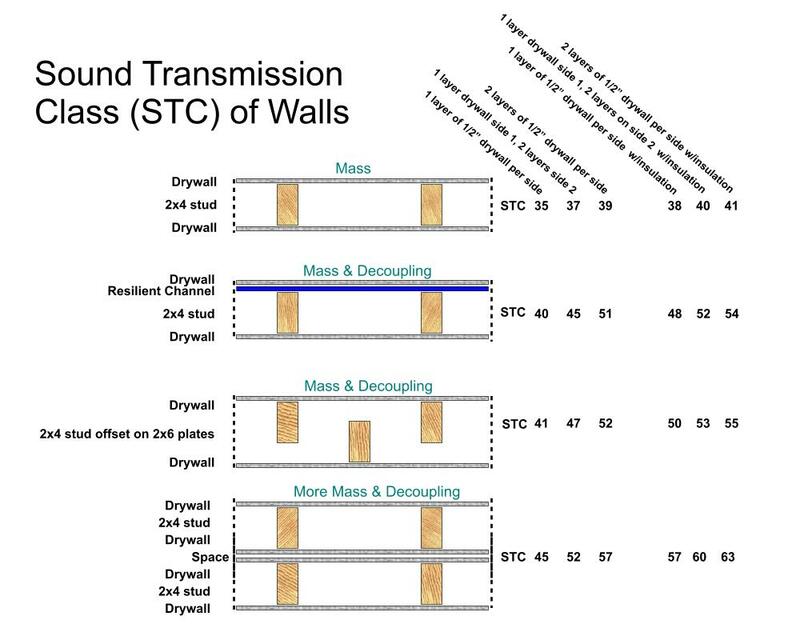 Objects, such as studs with drywall, can pass sounds to adjacent spaces (even though they have mass) by decoupling spaces the sound passed through the mass of an object can't effectively continue. The best techniques use mass, a decoupled air space, and more mass. Insulation plays the role of mass but has a limited impact when used alone. Brian’s first suggestion is not practical for most handyguys as it includes some serious construction.Â Greg could add another wall in order to decouple the interior wall, which connects Greg’s office to the rest of the house, with the inside office space.Â Another wall would help a lot, especially one which is insulated and uses 5/8″ drywall. If this is not realistic, you could just rebuild the interior wall using 2×6 top and bottom plates with alternating 2×4 studs so that no stud is connected to both sides of the wall.Â This decoupling method is used for the Handyguys home studio (see image to the right for more details on this method). Brian’s less expensive and less invasive option is to beef up the interior wall with an additional layer of drywall.Â In addition, Greg could replace the french doors with some solid core wood doors to add mass and decrease the sound transmission.Â Furthermore, these doors can be whether stripped like exterior doors.Â This middle level option is still intrusive as it will entail trim work with jamb extensions for the doors and/or windows. The most realistic and cheapest option is to provide some weather stripping around the interior doors and to close off any HVAC duct work that could be transmitting the sound from the rest of the house (something you would want to do with any option described above). For more details on Brian’s response, please listen to the podcast. Click on this image for a full sized view. 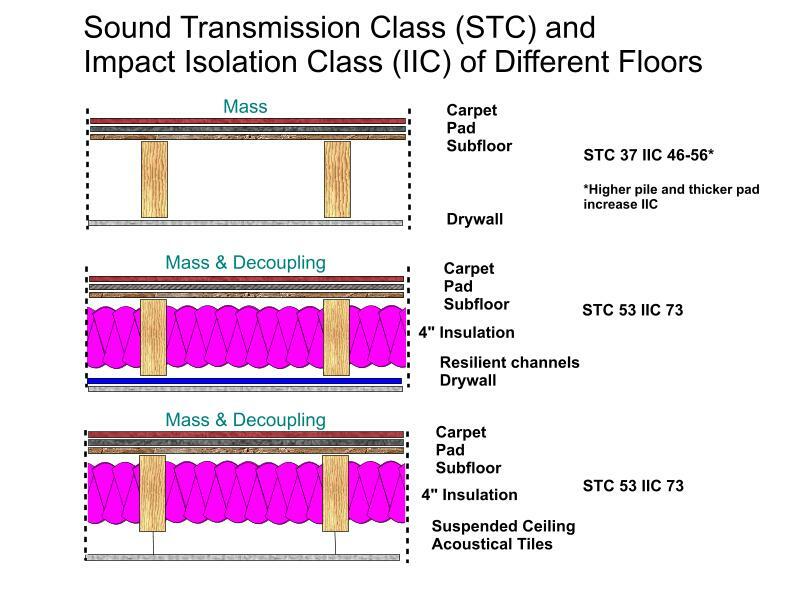 This image illustrates some possible techniques for controlling sound between floors. The sci-guys have another measurement for this, its called the IIC, or Impact Isolation Class. It deals with the sound heard from impacts to the floor as head from below. Imagine, sitting in your home theater and hearing people walking around upstairs. Again, isolation and mass play a part. Also, carpet and padding above are critical for helping with IIC. There is even a technique that involves pouring concrete but we didn't draw that, ask us if you want to know about it. How do the principals of sound insulation apply to the basement?Â Many handyguys are concerned about sound transfer when turning the basement into a cool entertainment space or a kids playroom.Â For the basement, the sound typically transfers through the ceiling, up through the stairwell or via your HVAC duct work.Â Are there methods for isolating the sound when renovating your basement? Listen to the podcast for more suggestions. This show is part of our Basement Finishing Series. If you are considering finishing your basement you should ckeck out our other shows. Guys, thanks for this show. I’m finding what you have to say about noise reduction very helpful. My podcast studio is on a busy four-lane road, and I find external noise a particular challenge. I’m going to implement some more of your tips to see if I can soundproof even further. Thanks for the great show. Great show guys…usually I’m working while listening and forget to comment…today I’m at home doing handy stuff…regarding the noisy room…if he is going to redrywall, he could use a product called QuietRock (www.quietsolution.com) which is half inch total but layered with other sound absorbing products. It is expensive though. I have also had good success with resilient channel/1/2 drywall and rock wool insulation and best with double 5/8 instead of 1/2, walls and/or ceilings. The resilient channel only needs to go on one side and remember to position the channel so the nailing flange is on the bottom. Resilient channel is also good on the ceiling as it “floats” out any waves in the joists, making a flatter ceiling. I remember from one of your early podcasts, Painting, another great tool that I love is a roller/brush spinner. It makes cleaning so easy and very efficient. I have used the same rollers and brushes many, many times and they are still almost perfect. John – Thanks for listening and for the great tips! Thanks for this awesome podcast and helpful tables. We’re putting up a new wall this week, and I was able to pass along one of these ideas ( the 2 x 6 plate with offset 2 x 4 studs plus insulation) to our general contractor to better soundproof the wall adjoining the master bedroom and an adjacent room. We were going to have a standard 2 x 4 wall built, and decided to insulate for sound dampening. After I found this podcast, I saw I could get a much better STC rating by going with this strategy. we are glad you found it useful. Make sure you dont put outlets back to back and caulk them in too. That will help a lot too. Thanks very much for this great show!!.. I have been looking for an article on Keeping the noise and sound insulation for ages. I want to make the roof of a room in my house spund proof , some people told me it’s impossible but know i believe it’snot. Can you just tell me how much would it cost ? ?..Thanks for sharing. Thanks for the kudos. Costs will depend on how far you are willing to go, what technique(s) you use, and how large of an area you do. I own a hair salon and have added 2 treatment rooms. My contractor built a drop ceiling when constructing the rooms with ceiling panels. My problem is – I still have noise inside the rooms. What is the most cost effective solution to keep the salon noise from these rooms? The best way, if its possible, would be to build a second wall next to the first. It should go above the drop ceiling to the roof or floor above.